In this research we explore the factors that affect memory for scenes. We study memory for scene details, however, our main focus in on common errors and distortions of memory that can help reveal underlying processes. For example, boundary extension, a phenomenon discovered in our lab, indicates the role of scene construction in memory for views of the world – as the observer falsely (and confidently) remembers having seen beyond the physical bounds of the view. In other research we are exploring the plasticity of spatial memory in response to changes in the layout of objects. We are interested in the role of scene structure, emotional scene content, and changes in viewpoint on memory. In collaborative studies with other labs we have been exploring the neural underpinning of scene construction. Mental scene construction allows the observer to incorporate anticipated future views of the world that are not currently available. The anticipatory representation it supports may facilitate integration of views during visual scanning and navigation as the observer interacts with a surrounding world. Four related publications: Intraub & Gagnier (2018), Gagnier, Dickinson, & Intraub (2013), Mullally, Intraub, & Maguire (2012), Gagnier, Intraub, Oliva, & Wolfe (2011). Forthcoming: Beighley, Sacco, Bauer, Hayes & Intraub, under review, Serva, Yildirim, & Intraub (in preparation). Learn more on our Publications page. Using brief presentation and eye tracking experiments we study what can be grasped in a fraction of a second from a scene. Here were have participants falsely remembering seeing the continuation of a view (boundary extension) as soon as 1/20th of a second after viewing a photograph. We have studied the effects of divided attention, inversion, and layout on anticipatory representation of the likely surrounding world. Four related papers: Beighley & Intraub (2016), Dickinson & Intraub (2009), Intraub & Dickinson (2008), Intraub, Daniels, Horowitz & Wolfe (2008). Forthcoming: Yildirim & Intraub (in preparation). Learn more on our Publications page. Unlike photographs, when scenes are staged in real (3-D) space, participants have the ability to grasp objects and navigate around them. How might this affect spatial memory? 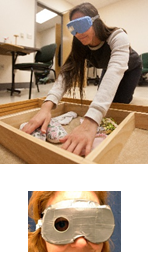 We are interested in studying spatial memory following visual and/or haptic exploration of objects and surfaces. Do both modalities elicit anticipatory representation beyond the bounds of the explored regions? Will this anticipatory memory transfer across modalities? 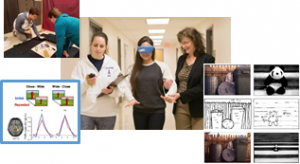 We have studied anticipatory scene construction in sighted-blindfolded participants and compared their performance to that of a “haptic expert” – a woman who was deaf and blind since early life. 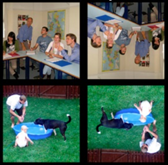 In other research we are interested in how top-down scene construction might interact with perception and memory in the case of low vision (simulated loss of the visual periphery). In other ongoing research we are testing the relation between the semantic relatedness of groups of objects and spatial memory for their spatial positions (object layout). Four related publications: Intraub & Gagnier (in press), Intraub, Morelli & Gagnier (2014), Intraub (2010), Intraub (2004). Forthcoming: Intraub & Delaney (in preparation). Learn more on our Publications page. STEM learning draws heavily on spatial cognitive abilities. In our research with preschool children, we are studying scene perception, and scene representation in memory. How well do young children process information presented at a glance? And what visual details they can the recall moments later? We are interested in the problem of “dual representation” – a photo we hold in our hand is an object but also a representation of the world. 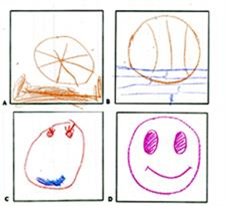 Do young children process the image as an object or as a partial view of an expected surrounding world? We address this by studying the factors that affect boundary extension (false memory for the continuation of a view). We conduct this research at the University of Delaware’s Early Learning Center. In collaboration with my UD colleague, Dr. Paul Quinn, we have also tested whether infants too make this anticipatory error when they remember scenes. Four related publications: Intraub & Gagnier (2018), Kreindel & Intraub (2017), Spanò, Intraub & Edgin (2017), and Quinn & Intraub (2007). Forthcoming: Intraub, Ly, & Vlachos (in preparation), Learn more on our Publications page.